MSIG takes and values your privacy seriously. To ensure that your personal information is secure, we communicate and enforce our privacy and security guidelines according to the Personal Data Protection Act 2012 (“the Act”). We take precautions to safeguard your personal information against loss, theft, misuse, as well as against unauthorised access, collection, use, disclosure, copying, modification, disposal, or similar risks. We provide regular training to all staff on this Policy, and to keep them abreast of any new development in privacy laws and regulations in. 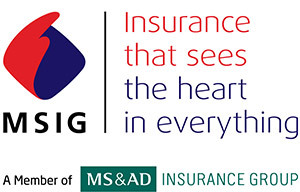 MSIG collects, uses and discloses your personal data only for the purposes as communicated to you. In this regard, we may disclose your personal data to our business partners, associates and third party service providers (in or outside Singapore) when reasonably necessary, and on a need-to-know basis. We will require these parties to protect personal data they may receive from us in a manner consistent with this Policy. We do not allow them to use the personal data for any other purpose. We will not sell your personal data to any person for any reason. As part of a global insurance group, we may disclose your personal data to our related or affiliated companies in the MS&AD Insurance Group, including but not limited to our holding companies (in or outside Singapore). We will also ensure that such disclosure will only be done when necessary, and will be in accordance with this Policy. We do not conduct any transactions over the Internet on our website. In this respect, we do not collect any personal data from this website. However, we may receive and store certain types of information, e.g. your IP address, browser type, domain names, access times and referring Web site addresses when you browse our website. This is accomplished by the use of tracking technologies or devices (such as cookies etc) by us or provided by third parties engaged by us. These technologies help us better understand user behaviour, facilitate website improvements, and measure the effectiveness of online advertisements. No personally identifiable data is used for this purpose. By accessing this Website, you are deemed to have consented to the use of the aforesaid tracking technologies or devices. Under the Act, you have the right to request for information about your personal data that is in our possession or under our control. You can also request for information about the ways in which your personal data has been or may have been used or disclosed by us within one year before the date of your request. An administrative fee will be imposed on you for the request. You also have the right to withdraw any consent that you have given to us for the collection, use or disclosure of your personal data. Please let us have any notice of withdrawal in writing, indicating your instructions clearly. If you withdraw your consent for the collection, use or disclosure of your personal data, we will inform you of the consequences of your withdrawal. You may write to our Personal Data Protection Officer for the abovementioned purposes. If you have any feedback or queries in relation to the protection of your personal data, you may also write to our Personal Data Protection Officer. We will look into your feedback or queries, and will provide you with a response within three (3) working days. If we are unable to do so, we will inform you within three (3) working days, and shall keep you updated of our progress every seven (7) working days.